(Nanowerk News) On most nights, Tom Yeh puts his 3­-year-­old son on his lap, opens a children's book and reads aloud. It's a much­-loved activity for both father and son as the characters are brought to life. A year ago, while reading the children's classic Goodnight Moon, Yeh, an assistant professor in computer science, began thinking about how to make books more accessible to visually impaired preschool-­age children. 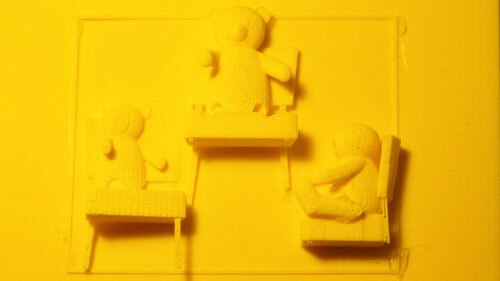 A page from the 3D-printed book Goodnight Moon. Although his son has no visual impairment, Yeh, whose research is focused on human­-centered computing - how humans and computers interact - set his sights on printing children's picture books using a 3­D printer. Characters and objects described in the storyline would actually pop off the page when printed in 3­D, enhancing the reading experience for visually impaired children. "I really enjoy reading stories with my son," says Yeh, "and I thought I might be able to contribute to making books for visually impaired children more tactile." Yeh leads the Sikuli Lab at CU­-Boulder, where he is training a team of talented students to conduct research to make computers see better and interact with humans more naturally. Sikuli means "God's Eye" in Huichol, the indigenous language of Mexico, and it symbolizes the ability to see and understand. His research program spans human­computer interaction, computer vision and software engineering, with a goal of enabling people to use machine intelligence to solve practical problems. Yeh is looking at ways to represent 2­D graphics in a 3­D, tactile way, and on a scale that's appropriate for young children's cognitive abilities and interests. By combining these factors into computational algorithms, he and his researchers are developing an interface that will allow parents to print their own customized books at home using a 3­D printer. The idea, says Yeh, is similar to Pandora radio, which offers curated music playlists based on individual preferences. "Three­-dimensional printing holds the key to simplifying the making of tactile picture books," says Yeh. "As 3­D printers become cheaper and more powerful, soon people will own a 3­D printer at home, just like now they own color printers at home." The graduate students who are part of Yeh's research team bring a variety of skills, interests and expertise to the project. Jack Sweany, a graduate student in construction management, looks at cognitive models in transcribing 2­D to 3­D as a way to deliver engineering information to construction workers. "It's easier to look at a 3­D print and understand what it represents," says Sweany, "compared to the typical 2­D plans and specs that are given to workers in the field." Abigale Stangl, a graduate student in ATLAS, has been volunteering at the Anchor Center for Blind Children, a preschool in Denver, which allows her to understand the target population, what their needs are, and how their parents and teachers teach them to read. "For the visually impaired, tactile development is important," says Stangl. "I'm interested in the different ways we perceive the world and how we can help create interesting experiences through touch. We're developing an interface to support the parents in creating storybooks for their children." Based on feedback from teachers of visually impaired students, Jeeeun Kim, a graduate student in computer science, simplified the tactile graphics and changed the design of objects on the pages to exaggerate the charac­-teristics of that object. For example, she turned a simple square clock into one with with a pendulum to make the object more dynamic in small hands. "Every kid needs a special book that provides the experience he or she needs," says Yeh. "It is impossible for mass production printing to do that so that it's easy to make changes and customize. With the price of 3­D printers coming down, it's not out-­of-­reach for a school classroom or a parent to print books. For a child, being able to read together with a parent is very important." Yeh's prototype book, appropriately enough, is Goodnight Moon.